Greetings blog readers and fish enthusiasts! Hope you were able to catch my radio show yesterday. In my first broadcast, I focused on the path to becoming a veterinarian, from my younger years all the way up to the present. We were able to see a contrasting opinion, that of the human medicine side, from my sister, Bailey Sanders, who is currently in her 4th year of medical school at Penn State. It was a great discussion and we took some great calls as well. KSCO 1080am is looking to have me host one Sunday a month. I will let you know when the schedule has been set. 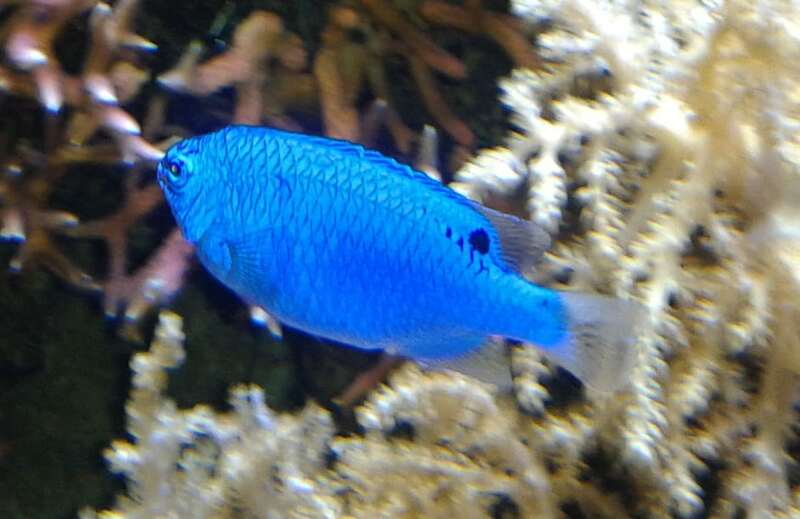 The blue damselfish (aka sapphire devil), like our fish last week, the yellow tang, is a common marine reef fish. There are many other species of damselfish that come in a wide variety of colors. They like to munch on crustaceans, plankton and algae. In the wild, some species of damselfish are algae farmers, growing algae near their rock homes to eat later on. Damselfish are extremely territorial and will chase away other fish and people coming near their farms and homes. They have been known to crack divers masks of those who venture too close. Even I have been bitten a few times while cleaning up their tank while I worked at the aquarium. If you are considering adding a damselfish to your aquarium, be aware that they will terrorize your other fish until they find the particular cave/crevice they like. Make sure your tank is large enough to support a territorial fish. It is also a good idea to add your damselfish as the first fish to a new tank. They are hardy and a good candidate for getting your nitrogen cycle up and running. Fish Vet on the Radio!